Automatic stacking cranes at Khalifa Port in Abu Dhabi. The acquisition will also help Konecranes achieve substantial growth opportunities in the service business as well as critical scale for further technological development. Its recent investments in business infrastructure and global footprint optimisation will provide significant earnings leverage, says a top official. For over 80 years, Konecranes has been dedicated to improving efficiency and performance of businesses in all types of industries by providing lifting equipment and services people can trust. Terex MHPS is a leading supplier of industrial cranes, crane components and services under the Demag brand, as well as port technology with a broad range of manual, semi-automated and automated solutions under several brands such as Gottwald. “The combination of the businesses brings together a family of leading brands that will provide an excellent platform for further sustained growth, open new growth opportunities in the service business and create critical mass for future technology development,” says Panu Routila, president and CEO of Konecranes. Routila says synergies will firstly come from procurement, including supply chain optimisation, insourcing/outsourcing and freight and logistics efficiency. Another significant contribution to synergies will be made from operations, including manufacturing footprint and capacity utilisation. A third source of synergies will be SG&A (selling, general and administrative expenses), including broader efficiencies, IT system consolidation and engineering and R&D (research and development) optimisation. In addition, dynamic synergies related to new opportunities in global service operations are expected to lead to significant earnings growth, Routila explains. For now though, the companies continue to operate as separate entities. The CXT Explorer ... easy portability. 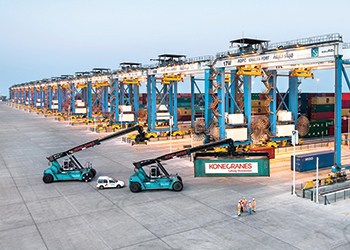 Konecranes has a strong presence in the region where it caters to a number of industries. It has clients from a diverse number of market segments including power, transportation, petrochemicals, ports and shipyards, as well as steel and general manufacturing. The company’s main focus is on Saudi Arabia, the UAE, Qatar, Egypt, Kuwait and Oman. Niklas Bronn, Konecranes’ head of Middle East region, tells Gulf Construction that Konecranes success is attributed to its many unique selling points. The company, he says, has the largest and most extensive service network in the industry. Deep industry knowledge is built into every Konecranes product, which has quality at its core. “We design and manufacture the key crane components in-house, to function flawlessly in the specific lifting applications of our customers’ industries. Our motors, gears and controls are designed specifically for cranes and in particular, lifting motions. This gives our cranes a longer lifetime and excellent functionality,” Bronn adds. Furthermore, Konecranes’ approach to crane maintenance is centred on lifecycle care, a comprehensive and systematic approach to maintenance, supported by world-class tools and processes. “Lifecycle care results in the highest lifecycle value, maximising productivity of uptime and minimising the cost of downtime,” he stresses. In terms of experience, the company is an industry-leading OEM (original equipment manufacturer) with wide experience and 460,000 pieces of equipment under maintenance agreement, says Bronn. “Konecranes’ experience resonates in our vast array of acquired brands and installed base. We own the intellectual property of all the brands we have acquired,” he adds. 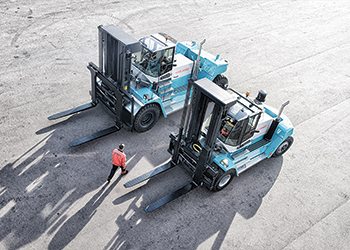 C series lift trucks models. Among its popular products in the region is the CXT range of wire rope hoist cranes. “The popularity of this model comes from its versatility, as it is ideal for nearly any industrial setting with lifting capacities of up to 80 tonnes. 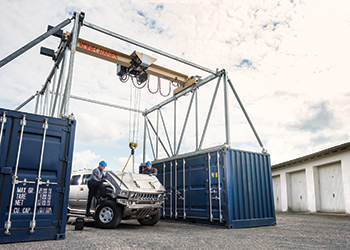 The CXT is available in many forms – from basic standard crane to high-tech advanced lifting, which is also available in explosion-protected design,” Bronn says. He says both these cranes come with the most advanced crane software available today. They have a wide range of smart features that give more control over the crane and its load than ever before, helping to accelerate processes and make them more efficient, he says. Lastly, as an industry leader in research and development (R&D) and a pioneer in smart technologies, the company has a proven track record for delivering and supporting innovative products and services. • Generation C lift truck: The C series lift truck includes a new driver’s cabin with first-in-class features to enhance safety, comfort and productivity. The C series also boasts increased reach stacker lifting performance, an enhanced Truconnect remote monitoring system and improved engine performance. • Boxporter RMG: Launched recently at TOC Europe, a global event for ports, terminals, and shippers, held in June in Hamburg, Germany, the Boxporter RMG crane is claimed to offer the clearest view in intermodal container handling with its “smarter cabin”, which gives the operator superb visibility and comfort. It also gives the operator an extended view to truck and train loading and unloading and container stacking, thanks to video and control information displayed on the cabin monitor. • CXT Explorer: A portable, strong and affordable solution for all kinds of lifting, the CXT Explorer’s innovative design allows its use both indoors and outdoors, with easy portability where needed to lift up to 6.3 tonnes. To create it, Konecranes mounted its popular CXT electric overhead crane on a tough steel structure atop a base made from two standard ISO shipping containers. This arrangement enables a sturdy foundation for lifting and provides a powerful and adaptable movable crane. The Boxporter RMG crane ... intermodal offering. 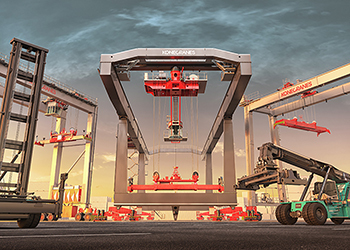 Konecranes has garnered an enviable portfolio of projects in the region. Among them is the largest container handling contract in the company’s history secured in 2010 from Abu Dhabi Ports for supplying Khalifa Port in Abu Dhabi, UAE, with 42 automatic stacking cranes. This was followed by a repeat order for an additional 10 cranes due to be delivered at the end of this year. Konecranes has also installed several overhead cranes with lifting capacities of five to 25 tonnes throughout the Grandweld Shipyards in Dubai, UAE, in 2011. The lighter cranes are used for lifting unprocessed steel plates, while the bigger capacity cranes are utilised to lift ship blocks and heavier segments. For loads of more than 25 tonnes, or for loads with long parts, two double-girder cranes can be used in tandem. With this connected configuration, loads of up to 50 tonnes can be lifted by both cranes together. Another strong sector in the Middle East is the power industry. Konecranes’ forte lies in the supply of overhead cranes for development and expansion of network projects in the region such as for substations or desalination plants. In addition, Konecranes supplied more than 40 overhead cranes of varying lifting capacities to United Precast Concrete’s (UPC) factories in Dubai and Abu Dhabi. Synchronised dual-hoist cranes were installed to enable the safe lifting of long hollow-core slabs without load rotation. Furthermore, higher crane travelling speeds of 100 m per minute were provided to allow for the long distance the crane needs to travel in the casting bay, to cope with the curing time of the concrete mix. Among other projects, CXT double-girder cranes with lifting capacities of two to 80 tonnes have been supplied for the Dubai facility of Legnano Teknoelectric Company Middle East that processes electrical steel to produce magnetic cores for electric transformers; and a Goliath gantry crane, with a lifting capacity of 300 tonnes, has been installed in the Drydocks World yard to assist in the manufacturing and assembly process at the outfitting and assembly area which covers 16,500 sq m.